« What does it take to give that ‘Extra’ bit of effort? Alex Honnold definitely likes to live life on the edge and takes calculated risks to achieve his goals. Making this climb, Alex said ‘some climbers sit on the ledge on their backsides and edge along, I thought it would be cooler to walk…..when you are climbing, the fear is not there’. Some might say he is courageous, I know I would! So what is courage? It is simply acting on what we should do, regardless of any fear we may have. It is the choice to disregard worry. It is the choice to do right, to pursue our dreams, to be successful people, to lead the way for others. Today’s leaders face all kinds of challenges that require courage. Do you have the courage to make tough decisions? Do you have the courage to stand out from your fellow leaders and stand for what you believe is right? Do you have the courage to admit when you are wrong? Do you have the courage to change directions? Do you have the courage to empower your people? Do you have the courage to listen and embrace new ideas? Watching this clip made me think about what makes a courageous leader and can leaders develop this courage? Many leaders reach the top and admire the view, great and courageous leaders celebrate the climb and how they got there and take in the view looking for their next challenge! While I’m a firm believer in learning to be content where we are, there must also be a measure of dissatisfaction with things always being the same. Contentment helps us learn to survive and be happy with what we have. Dissatisfaction helps propel us forward to better things that we know can be achieved. While we cannot live in a state of unhappy dissatisfaction, we can use that dissatisfaction to grow our measure of success. Nobody likes a panicky leader. While any leader may become worried or distressed, how they handle those situations says a lot about them. Keeping cool under pressure produces a calmness that spreads within an organization, allowing everybody to think with a clear head and develop strategies that will bring you through any crisis. Keep in mind, however that poise without action is just as devastating as panic… it just takes longer to feel the results. Leadership itself is a risk. There is no safety in standing up or stepping out when everybody else is just sitting around. Sometimes the risk is mental or emotional. Other times the risk will be financial. But there are very few profitable investments that don’t require some measure of risk. True leaders understand that risk is a part of the job. It’s possible to rationalize your way out of anything. The problem is rationalizations reduce us to inaction rather than action. Nothing ever gets accomplished when we can find all the reasons not to do it rather than looking at why it needs to be done. Focus on the goals and find ways to get there, instead of reasons not to try. Every person has potential for greatness. Leading is rarely ever easy. Some have natural ability, for others it must be developed. But every leader faces the same trials and struggles. Learning to overcome the roadblocks and other obstacles that often try to set us back is essential if we are going to reach our fullest potential. 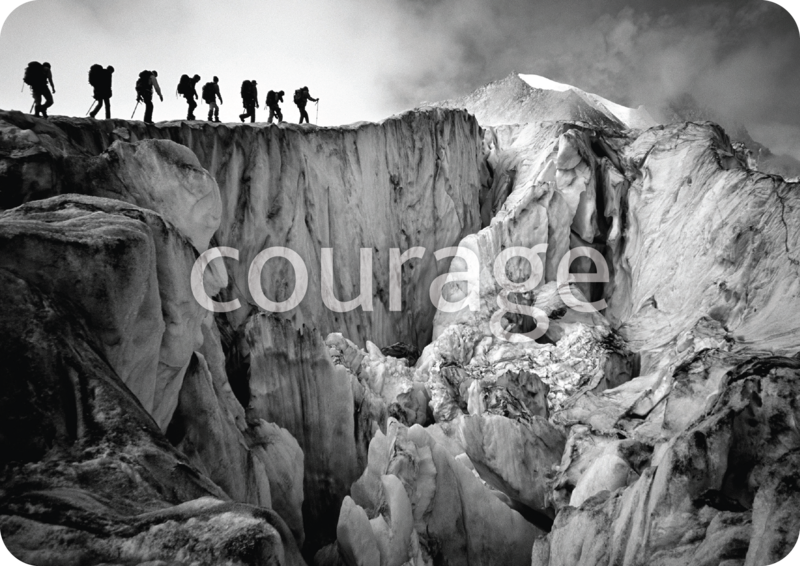 Courageous leadership means finding ways to succeed regardless of our circumstances. It means putting ourselves out there, facing our fears, doubts and potential ridicule all for the greater good. What sort of leader do you want to be? Do you want to stand out from the crowd when it matters? Unlike Alex, most leaders have a team of people who can act as your support team, you may be the lead climber showing the way…but you don’t have to climb alone! What you need is the courage to take the lead. This entry was posted on February 16, 2012 at 12:31 pm and is filed under Executive Coaching, Leadership, Management Development, Training & Development. You can follow any responses to this entry through the RSS 2.0 feed. You can leave a response, or trackback from your own site.